For over 9 decades, LAUGHLIN’S has been providing Minnesota pest and critter control for the, Minneapolis – St. Paul, Minnesota metropolitan area. Let our family keep your family safe with our comprehensive Minnesota pest and critter control services. In 1920 Hank Smith opened the doors of Smith Exterminating for business, offering the city of Minneapolis pest control services. 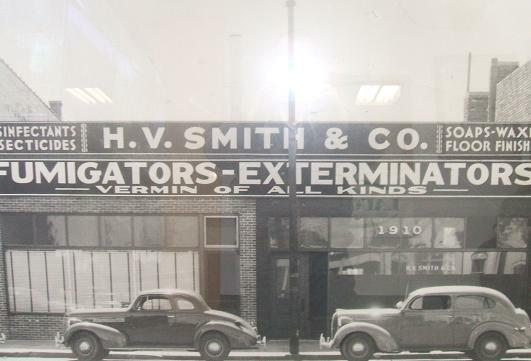 Hank owned and operated Smith Exterminating until 1955. During those years, Hank opened the doors for H.V. Smith Co. a chemical compounder of soaps, waxes, disinfectants, insecticides and rodenticides. Robert Laughlin purchased the companies from Hank in 1955, and Robert owned and operated Smith until he sold the company to his son, Michael, in 1978. Michael assumed control of the company in 1978 and changed the name to Laughlin’s Pest Control Co., Inc.
Mike has been at the helm ever since. In 1989, seeing the need to add services for nuisance animals, Laughlin’s acquired Critter Control of Minnesota. This division of Laughlin’s deals with wild animals that invade peoples homes, yards and businesses. Since 2007, Laughlin’s has added turf and ornamental, lawn maintenance, goose control and snow plowing services. We are proud of our service. We would be proud to serve you.